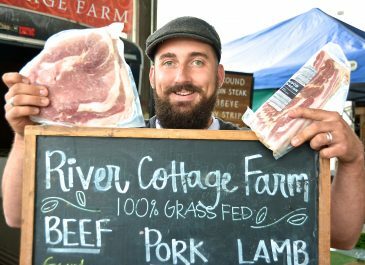 River Cottage Farm is a small family farm producing 100% grass fed (and finished) beef, lamb, dairy, goat and naturally reared veal. 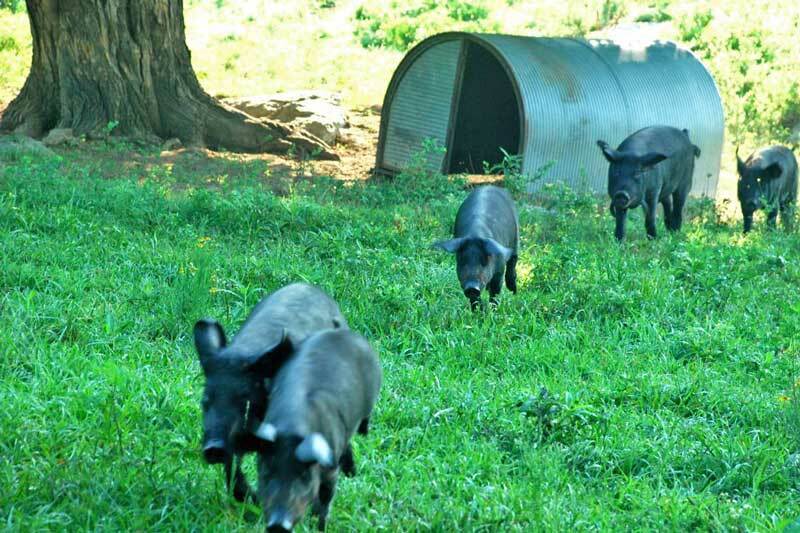 Our pastured broilers, laying hens and pork are raised on pasture with 24 hour access to grass, bugs, minerals, clean water and certified Non GMO feed. 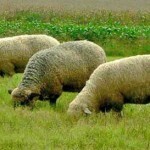 River Cottage Farm cattle, sheep and goats are raised on their natural diet of grass alone. The highest standards of animal welfare and environmental care show in our dairy, meat and eggs. River Cottage Farm animals are treated with care and respect and are never subjected to hormones or chemicals. River Cottage Farm soils are tested yearly to monitor their micro and macro nutrients and only certified organic amendments are used to balance our soils. This care of the soil nourishes the billions of microbes that make all of those wonderful nutrients available to our livestock and in turn to our customers. River Cottage Farm pastures are rotated on a daily basis and our chickens are not penned on pasture but allowed to roam freely. Our working family farm includes Scottish Highland cross beef cattle, Dutch Belted dairy cattle, Cotswold, Romney and North Country Cheviot sheep, Nubian goats, Large Black pigs, Freedom Ranger broiler and Rhode Island Rd hens. 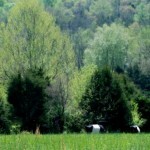 River Cottage Farm is happy to be a long time year round member of the Franklin Farmers Market. From the handful of porkers raised every year at River Cottage Farm we sell some as cuts but most of our pork is turned into our Org Ginger, Sage and Dried Apple Breakfast sausage and Applewood Smoked Bacon at the talented hands of our friends at Smoking Goose in Indiana. 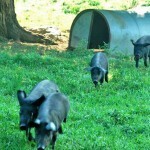 Our pigs are fed only certified Non-GMO feed along with milk, whey and leftovers from our garden. Our Freedom Ranger chickens spend their entire lives out on pasture after they leave their nursery at the age of three weeks. They receive only Certified Non GMO feed, grass, bugs, minerals and milk. 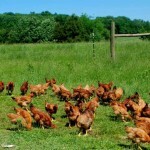 Our eggs are produced by our 250 talented Rhode Island Rd hens. The girls have 24 hour access to pastures, certified Non GMO feed and fresh water and bugs. We supplement their feed with a daily dose of cultured dairy to keep them healthy. You can read more about our hens at our blog and see how we keep them safe and sound while allowing them to roam the pastures. Our Scottish Highland girls are crossed with a Devon bull to produce a steer that will finish within the USDA 30 month guideline. 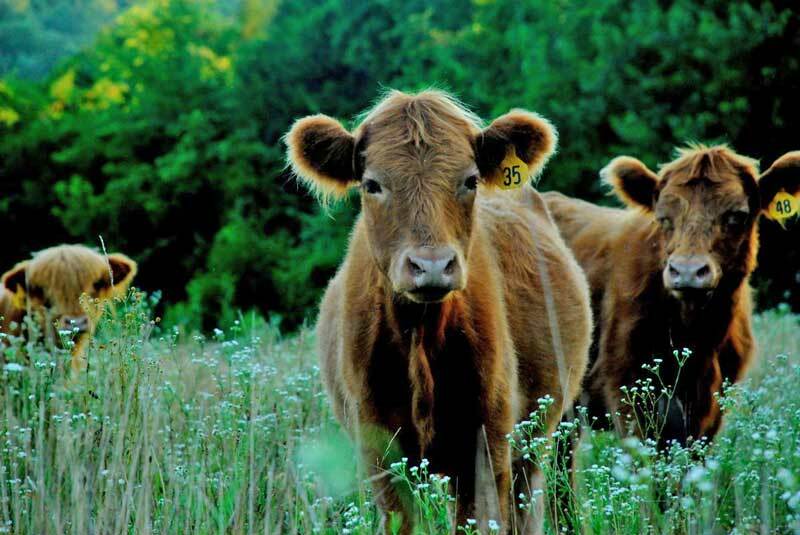 Our cows breed naturally and calve year round to keep us in a good supply of beef. Our beef is dry aged 14 to 21 days at our local abattoir. All of our beef receive kelp, hi selenium and Sea-90 salt to supplement their mineral intake. Our cows, beef and dairy, never receive any grain, not to make them friendly, not to get them to come into the barn, not to stand still in the stall. They just don’t need it. 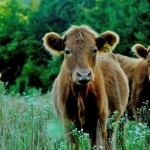 At River Cottage Farm we are 100% committed to keeping our cows 100% grass fed. Statistics have shown the correlation between higher levels of CLA’s (conjugated linoleic acids) and lower incidents of breast cancer, chrones disease, heart disease and many other illnesses that plague our country. Lamb was the first animal we raised due to my desire to learn to spin wool. Imagine how happy we were to learn that they taste amazing to boot! So here at River Cottage Farm the girls stay on the farm and produce beautiful, bouncy babies and luxurious fiber which is sold in the form of raw fleeces, roving, yarn and knitted garments. Since I can’t keep every lamb on the farm, the boys provide all of our wonderful cuts of lamb for sale. Once again, our lambs are 100% grass fed and receive minerals and salts without the additions of antibiotics or hormones.